Replace water every 120 days with fresh water and solution to kill bacteria and other growth. Tag eye wash stations so there is a service record clearly indicating the last time the water was changed and station serviced. Clean and make sure it ready to use in case of emergency. Minimum charge unless done at same time as scheduled FAKM service. 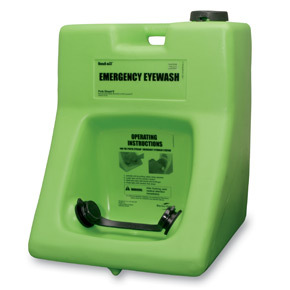 Flush lines every 120 days for a minimum of one-minute to ensure unit is ready for emergency use. Tag plumbed stations so there is a service record clearly indicating the last time the water was flushed and station serviced.